The artwork should provide insight into different cultures in the family of mankind, the customs, celebration, emotion, love, peace and respect of any of the different cultures of our planet. The work can be expressed from representational, expressionism, surrealism or abstraction. 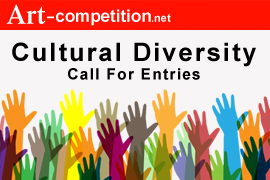 Art-Competition.net announces a call to artists for “Cultural Diversity” an online international competition. First Place $800. Total prizes: $1,675 in Cash and Extensive Art Marketing Prizes. Deadline: February 8, 2016 (Midnight EST). The artwork should provide insight into different cultures in the family of mankind, the customs, celebration, emotion, love, peace and respect of any of the different cultures of our planet. The work can be expressed from representational, expressionism, surrealism or abstraction. The artist and their work will be included and presented as a "Featured Artist" in the "InternationalArtistDirectory.com" that is marketed to over 10,000 art buyers. The winner's artwork will also be marketed in our email marketing campaign "Art Market News™" with over 16,000 subscribers. The artist and their work will be marketed through our social media-marketing network through LinkedIn, Pinterest, Tweeter, FaceBook, GooglePlus, Instagram, etc. The artist and their work will be included and presented as a "Notable Artist" in the "InternationalArtistDirectory.com" that is marketed to over 10,000 art buyers. * The 1st, 2nd, 3rd, 4th, 5th 6th and 7th place winner's work will be featured in Art-Competition.net "Winners Showcase", with links to their websites. Not eligible to enter? - Find contest where you are. COPYRIGHT: The artist retains all copyrights to their artwork without exception. USAGE RIGHTS: By entering this art competition, you are granting us a non-exclusive perpetual license to reproduce images of your artwork on our art-competition.net website and in our newsletters, and in the marketing of the art competitions to the general public. Artworks will not be used for any other purpose than that which is stated here. All winning entries will be displayed on the art-competition.net website. Each entry becomes part of the public, historical / archival online contest catalog. It can be removed at a later date upon request.